'Butterfly Kisses' has fragrant 3-inch wide double flowers with bright pink pompom-type centres. It's understandable why the butterflies would be wanting to kiss them! ‘Butterfly Kisses’ is a compact cultivar making it ideal for garden edging or containers. Try planting it with rudbeckias for a nice colour contrast. Echinacea purpurea, commonly known as the Purple Coneflower, is one of North America's most popular herbal plants. In fact, it was voted Perennial of the Year 1998 by the Perennial Plant Association! It is used to prevent and treat the common cold, flu and other ailments. As a cut flower, it also makes a wonderful addition to summer bouquets. Each stem bears one flower, which has a round disk with spiky purple chaff and downward drooping purple-pinkish petals. 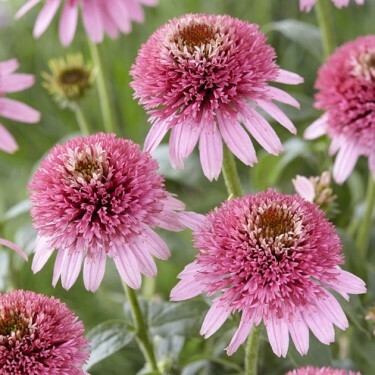 Echinacea is easy to grow and weather resistant.